We’ve given the greatest companies the energy to succeed. 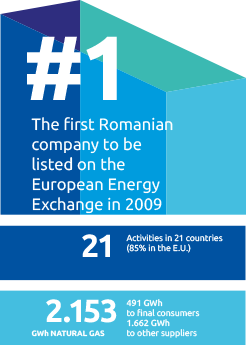 Leader in the electric energy supply area, Tinmar has become the largest private energy supplier in Romania. 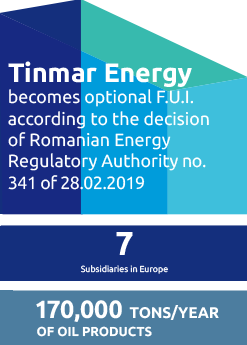 Leader in the integrated energy services, Tinmar is a solid and large Romanian business, dedicated to delivering integrated utility services – electricity, petroleum and natural gas – to industrial and household consumers. Our ambition is to become the best modern utility services company in the region. After the merger Tinmar Energy continues its activity structured on three divisions associated to its business lines, in order to maintain and increase its capacity of serving clients. The figures show the continuous increase of Tinmar, throughout the past six years, which is evidence that the strategies chosen within the company were correct. Maintaining a stable portfolio, flexibility towards the client, maintaining the leadership and extending towards new markets represent the constant priorities of Tinmar. The flexibility of services allow the company to become an efficient interface between the large energy and gas producers and consumers of all kinds. With an energy mix to envy, based on a varied range of resources, Tinmar can supply the products and services you need, regardless of the specific necessities of the activity you are carrying out. With over 1.500 active clients in year 2015, Tinmar has established its position on the market, and proved itself to be a trustworthy partner. Starting with the trading of petroleum products, Tinmar has developed its portfolio throughout the following years, becoming, one by one, an electricity supplier, a natural gas supplier and the producer of renewable energy from solar panels. Tinmar has become market leader as result of its client-oriented policy, with complete services and flexible packages, as well as due to its permanent concern for development and for the quality of the energy supplied. The flexibility, the care for the user, and the constant development of its services has brought Tinmar in a top position in the preferences of clients. Tinmar has permanently won new clients and partners, but has especially maintained the loyalty of users, through an efficient commercial policy. Being competitive and socially responsible remain the company’s priorities. Tinmar’s main values are professionalism, flexibility, transparency, client orientation and permanent development. Its strategic directions target new investments with sustainable performance, ensuring a constant and stable increase in the company’s portfolio. Maintaining the leadership and extending towards new markets represent the constant priorities of Tinmar.